3 Bedroom Terraced House For Sale in Nottingham for Asking Price £130,000. 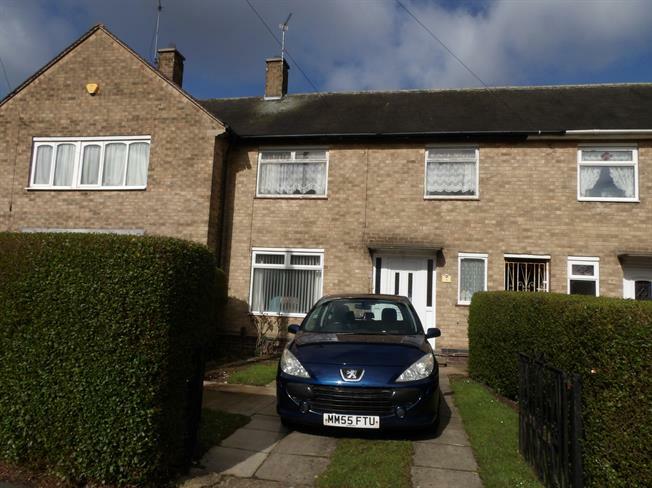 Three bedroom BRICK built middle terraced house which would be ideal for a first time buyer. The property is located on this much sought after road and viewing is highly recommended. The property benefits from a gas central heating, part double glazing, off road parking for two cars, lovely rear gardens and no upward chain. The accommodation comprises entrance hall, lounge/diner, fitted kitchen, toilet, stairs to landing, three double bedrooms, wet room. To the front there is off road parking, enclosed rear gardens with outbuildings. Double aspect double glazed uPVC windows facing the front and rear. Radiator and electric fire, carpeted flooring. Back single glazed door. Single glazed window facing the rear. Radiator, carpeted flooring, built-in storage cupboard, part tiled walls. Roll edge work surface, wall, base and drawer units, single sink, space for oven and washing machine. Single glazed uPVC window facing the rear. Radiator, carpeted flooring. Double bedroom; single glazed window facing the front. Radiator. Single glazed window facing the rear. Radiator, tiled walls. Low level WC, electric shower, pedestal sink. To the front there is off road parking for two cars. Enclosed rear gardens comprising lawn, paved area, beds, borders, outbuildings.